I think the lack of platform makes them classic. OMG! They are "must have" indeed. I saw them in real, they are very nice. I luuuuvvv them!! Put a period between the "9" and the "5", add a zero and they're mine!!! 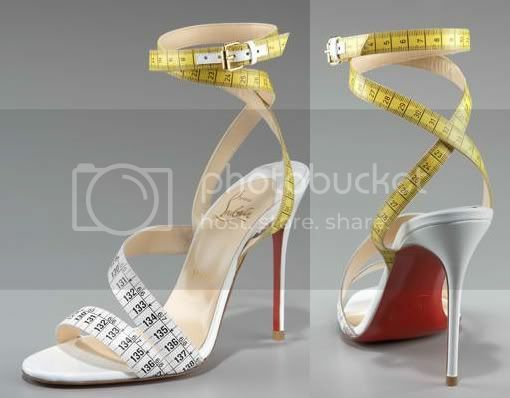 Last year in London we saw a girl get on the tube wearing navy-blue pumps (about 5" heels) with white measuring-tape trim up the back of the heel, and a measuring tape rosette on the toe. Adorable. These are pretty cute too! I agree about the lack of platform giving a more classic look. I must have these, but I'm pretty sure they are not going to be popular, so they might end up on the sale rack. Here's hoping! Do Louboutins actually go on sale?! You can sometimes find them. I wear a 40 or a 41. They NEVER, EVER have my size on clearance. Well... in anything I'd actually want to wear. I'll keep an eye out for you, but it might be awhile before these trickle down. Ok.....now I think this is the cutest!! Darn, I just had an epiphany! I just threw out some worn shoes I wanted to keep but my husband gave me an option to keep without buying or throw away and 'browse' for another. I chose the later because that usually means "I'll get you some more...you just don't know it yet." Erica, these shoes have your name (and mine) written right next to the inches and centimeters! hmmm... these would frustrate me - I need inches as well as centimeters! I MUST find myself a pair! !